Printers that will meet all of your needs for a wide variety of applications. 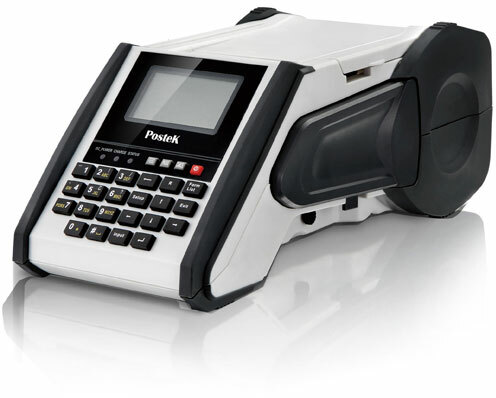 The Postek V6 brings flexibility and user convenience, an affordable choice for a variety of mobile workforce applications without compromising features. The versatile V6 offers the long-lasting image durability thermal transfer printing delivers, plus direct thermal printing capability to complete the job fast no matter the application requirements. Choose to download label forms in advance or simply input information on-the-spot, so no asset is missed. With large memory, high storage capability, easy input, real-time clock functionality and carrying convenience this printer gets the job done. And, for added value, Postek packages every printer with robust label software to create labels right out of the box. 203 dpi Thermal transfer printing, 8MB FLASH ROM, 8MB SDRAM, Long lasting 7.4 Volt 2200 mAh Lithium-ion battery, Reflective media sensor, Real-time clock, USB 2.0, including battery. Comes standard with robust label design software in the box, Predictive text input, and is Compatible with popular brand consumables.